A year ago, I came across an Internet article by CNN entitled Asia's most sinful cities where the seven deadly sins were assigned to a corresponding Asian country that matches it. (http://travel.cnn.com/explorations/life/asias-most-sinful-cities-174006) Being a big foodie, I was so surprised with their choice of Asian city for gluttony. I expected to see Hong Kong, Singapore, Penang or Okinawa but from all the power house Asian food cities that I know of, it was Taipei that was assigned the sin, gluttony. With this in mind, I was so looking forward to check out the food scene in Taiwan and find out if gluttony really fits the description. We arrive in Taipei during the wee hours of the morning. I initially thought that we'll end up in one of the convenience stores to eat but just a few feet away from our hotel were numerous food street stalls serving fresh hot meals.As it turned out this whole area was serving food 24 hours a day. We ended up eating fried rice, fried noodles, chicken popcorn and different grilled items. The taste of black pepper was so evident in all of the dishes. The food was nothing fancy, it tasted good and it did it job to fill us up. On our first day, we were so disappointed with our first meal in Modern Toilet. Luckily for us, the resto is in the Simending area. The whole place was filled with a lot of restaurants and food shops, so off we go in search for more food. One of the famous food chains in Taiwan is Hot Star Fried Chicken. The queue was pretty long and we had to wait for around 25 minutes before getting our order. The food shop is known for serving large fried chicken. When they say large, they mean large, you can hide your face behind the rectangular piece of breaded chicken fillet. Doused with black pepper and chili powder, it was tasty and crispy but I was disappointed on how little chicken meat was inside. I barely tasted the chicken, the crispy coating was thicker than the chicken itself. Beside Hot Star was a soft serve ice cream shop where we saw a lady who was carefully and slowly making a Tall Ice Cream Cone. It was about a foot long or even taller. I love Roti and the Flaky Scallion Pancake reminded me of it. Also called Chinese Pizza, this little treats is made right on the spot. Starts with spreading a ladle full of rice flour on a circular griddle, whole egg is added with a generous portion of chopped spring onions, folded as it cooks then served. Hot, flaky, tasty and addicting-ly good. We saw people lining up at a food store, the name of the store is Ay-Chung Flour-Rice Noodle. Upon taking a closer look, they were serving Misua, a kind of thin rice flour noodle soup. The line was long but the server was scooping up ladle fulls of the soup like an energizer rabbit. There were chucks of liver inside the soup and the broth tasted of innards. It was already pretty tasty but people were adding some sort of a sauce in it, we followed. It turned out to be black vinegar, the addition of it plus the wansoy on top made the soup more interesting. The soup is something I would imagine eating when the weather is really cold. There has been tea store explosion happening back here, stores has been opening left and right. 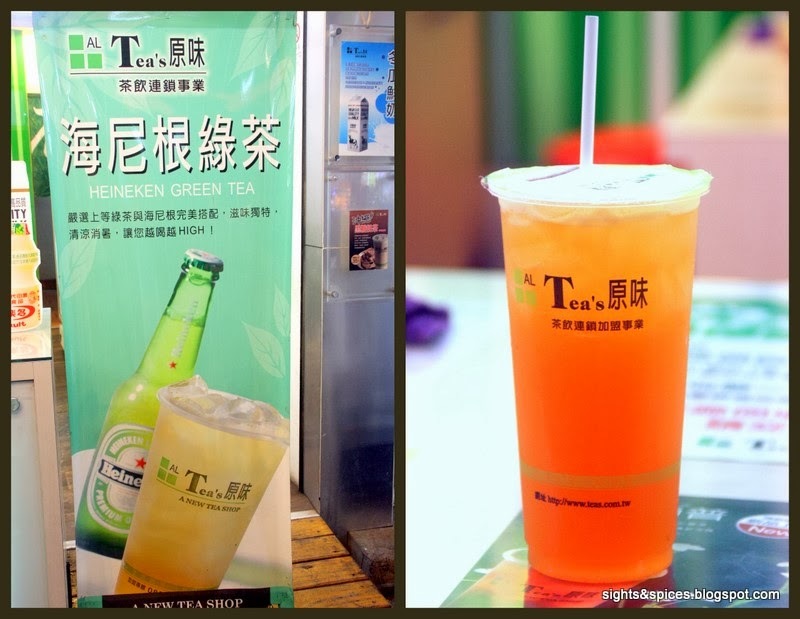 If you are a big fan of Sweet Tea Concoctions, you'll definitely love Taipei. 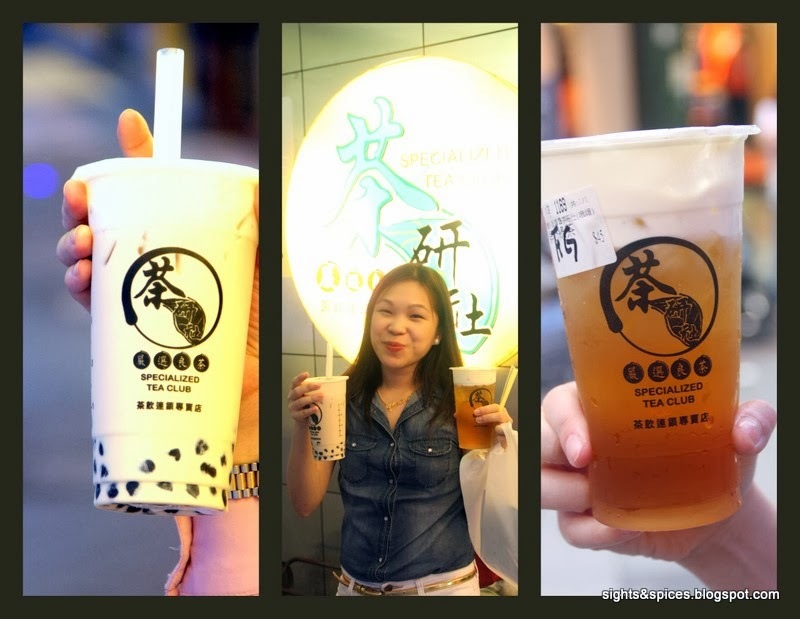 You can practically find a store in every corner and what's even better are the prices, a tea drink is way cheaper in Taiwan. One interesting tea drink that I tried is the Green Tea Heineken. Initially tastes sweet then leaves a slight beer bitter aftertaste. After visiting the Gold Museum we headed for Jiufen Old Street. We were yards away from entering the busy alleyway of Jiufen and we could already smell the glorious aroma of food. As soon as we entered, food shops greeted us from all direction. There was so much food to try out. We started with a Stuffed Meatball. Stuffed with cabbage and shrimp, breaded then fried, the meatballs were delicious. Squidballs cooked in a fiery curry oil, I just had to taste this again. Ever since I tasted this in Hong Kong, I'm always on the look out for this. The Fried Deep Sea Squid looked promising but it was just an artificially flavored starch based piece of squid. It was hard to resist not trying out the Grilled Snails. Good thing we did because it was deliciously fresh and tasty. We found an interesting couple who was making a dessert. The husband was shaving candied peanuts off a huge block then places it on top of a lumpia wrapper. The wife puts two scoops of ice cream on top and wraps the whole thing. Tasted pretty ordinary, nothing really special. 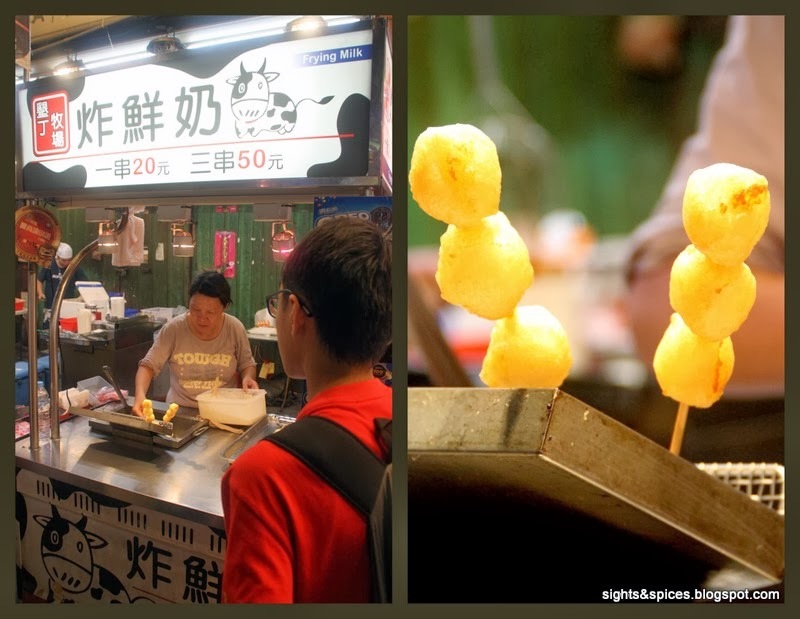 If there is one thing that one must try in Taiwan is, it's Stinky Tofu. Named as such because of its foul smell, its hard to describe how it exactly smells like, to me it smells rotten. Doused with a spicy sauce and topped with pickled cabbage. I love tofu but I'm really not a fan of this, it smells rotten and taste of it too. Maybe it's just an acquired taste because I've heard people swear how good this is. 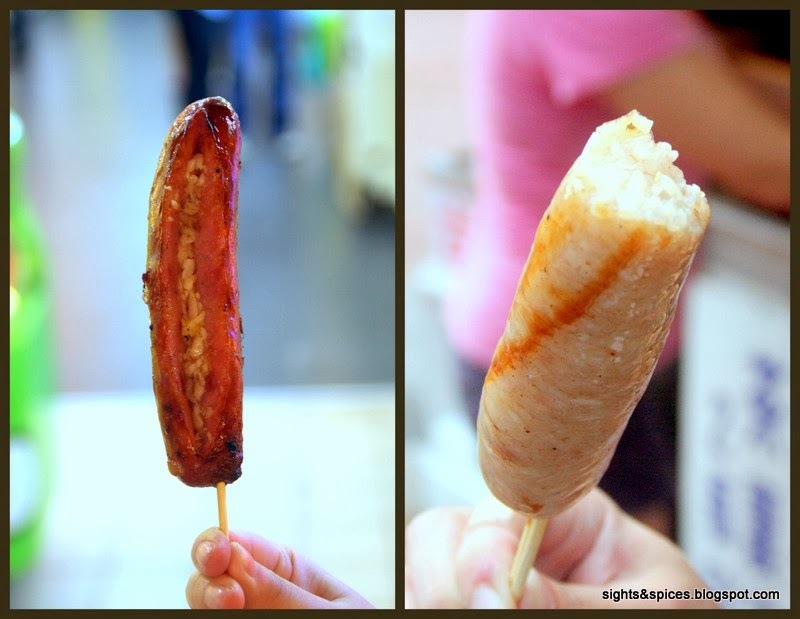 That night, we went to Shilin night market and met Achi Angie, she treated us to every must eats found there. First thing she asked was if we were brave enough to try out snake. Without any hesitation, we said yes and made our way to the store that cooks and serves Snake Meat. The snake meat was cooked in broth with Chinese herbs, just like with anything exotic, this supposed to be an aphrodisiac. It was my first time to eat snake, it was like eating a very thorny or boney piece of chicken meat. 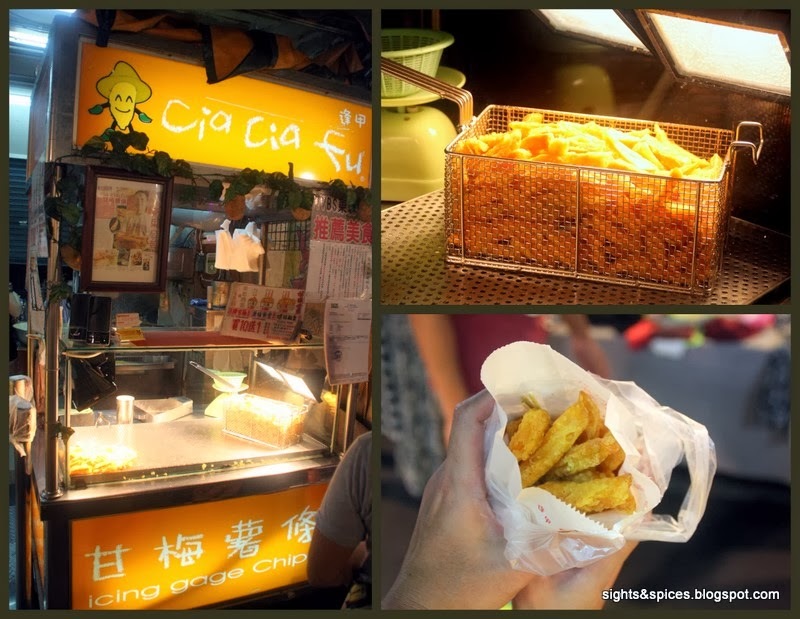 As soon as we set foot at Shilin's food court, I was overwhelmed with what I saw. The food court was literally like a maze, stalls after stalls were lined up everywhere. It was an overload of all senses, chaos in a good way. We settled in one of the food stalls and Achi Angie proceeded to order. First up was a Sticky Soup with Pork, Squid and Vegetables. Broth taste of innards and it had a sour fermented tasted, not really a fan of this. Made fresh upon ordering, the Oyster Cake pretty much tasted the same like what you find in Chinese restaurants back here. 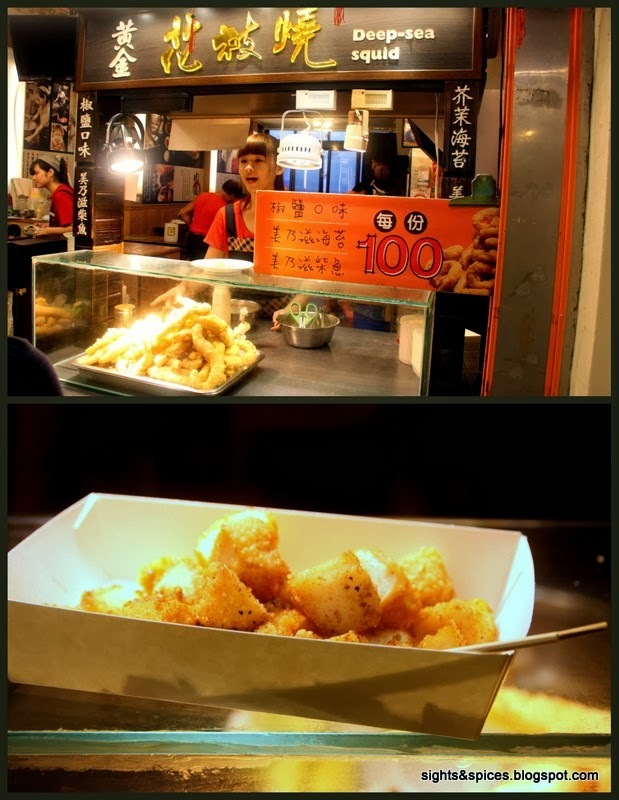 For our second bout with Stinky Tofu, the tofu we tried this time was fried. The fried version was less stinky and it tasted more pleasant than the grilled version. But still, I'm not a fan, it's something I can eat but not crave for. We continued walking around and I spotted a store making Coffin Bread. 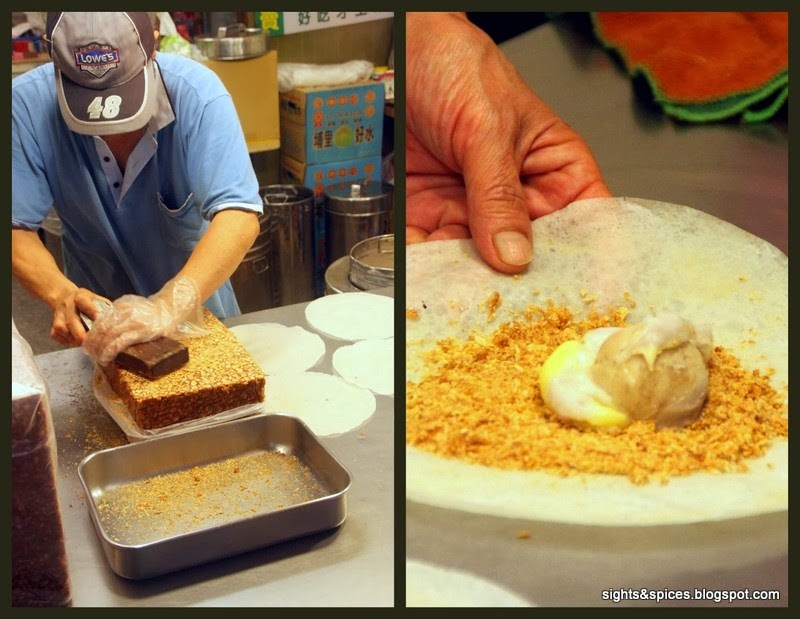 It starts with deep frying a super thick cut slice of bread, the top gets sliced off then stuffed with your choice of filling. The sliced off pieces of bread is place back on top then served. Another way of making and serving a sandwich. We headed back up to the streets to continue to look and eat more food. One of the famous and favorite stores that always has a long line, is this store that sells Black Pepper Buns. The buns are made and cooked right on the spot. The dough are stuffed with beef and spring onions then baked in a tandoori oven. I enjoyed the Black Pepper Buns so much that I wolfed down two easily. The bread was flaky, beef filling tender and I loved how it really taste of black pepper. Too much of the spice can be unpleasant in the mouth but this buns has just enough kick and didn't overwhelm the flavor of the filling. A must try! 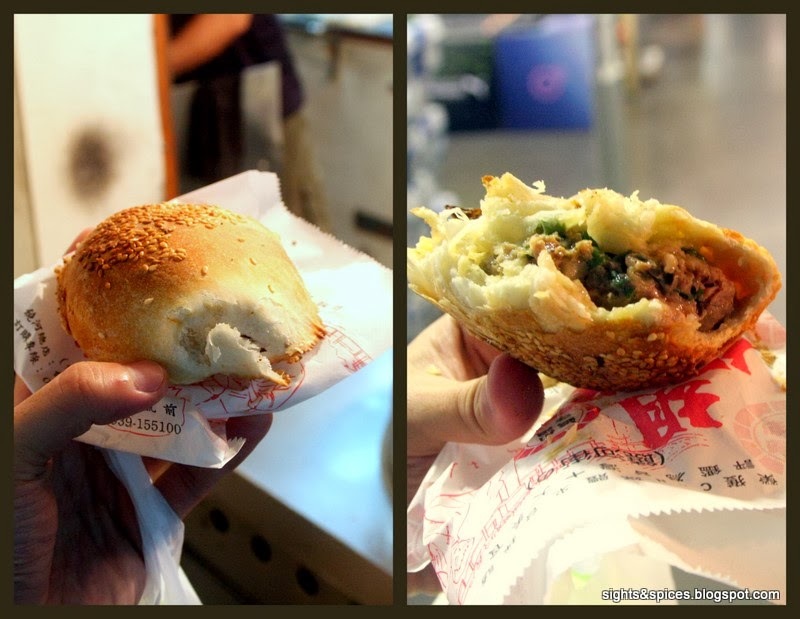 One thing I also enjoyed so much is the Steamed Meat Buns, it's very similar to the fried siopao found in Binondo. Stuffed with a huge tasty meatball, the buns were soft and moist with a browned crunchy bottom. Another must try! An interesting find is the Fried Milk Balls, the balls had a crunchy crust and a sticky sweet milk filling inside. We wanted to check out the bar scene and try out their local beer. There wasn't much of a bar scene, it seems that the locals prefer to drink right on the tables set up on the streets. The people we were drinking with at the bar where mostly expats. The Taiwan Beer was light and sweet, it's the type of beer that you can chug down in one go. The next day, after having a wonderful lunch at Barbie Cafe, we were off again to look for more things to eat. 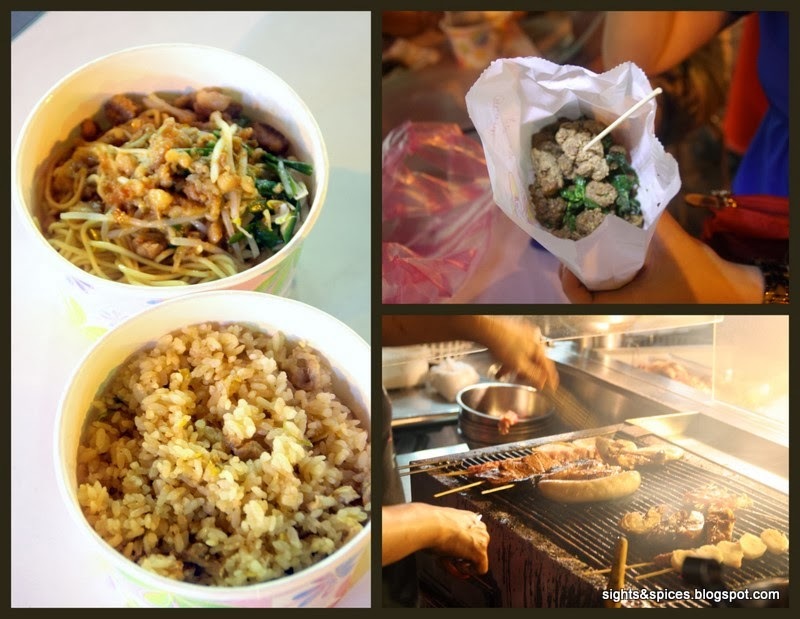 We headed to another famous night market, Raohe. One can practically find the same food stuffs in Shilin and Raohe so we looked for things we haven't tried the night before. One of the most common thing you can find around is Sausages, I went to a stall and found out that they were selling two kinds of sausages. The first sausage was typical made of meat. It was pretty good, taste of five spice and you can opt to ask for cabbage to be put in the middle, reminding me of sauerkraut. The second sausage was made of rice, it's the first time I've ever seen something like it. As I was told by the vendor, you should hold each sausage on each hand and take bites alternately. It's like having a complete meal on skewers. It looked like french fries but when I took a closer look, it was Sweet Potato Fries. I bought a pack and upon first bite, we were blown away how deliciously sweet it was. Crunchy with a soft center, the fries were doused with black pepper to give it a kick. Must try! 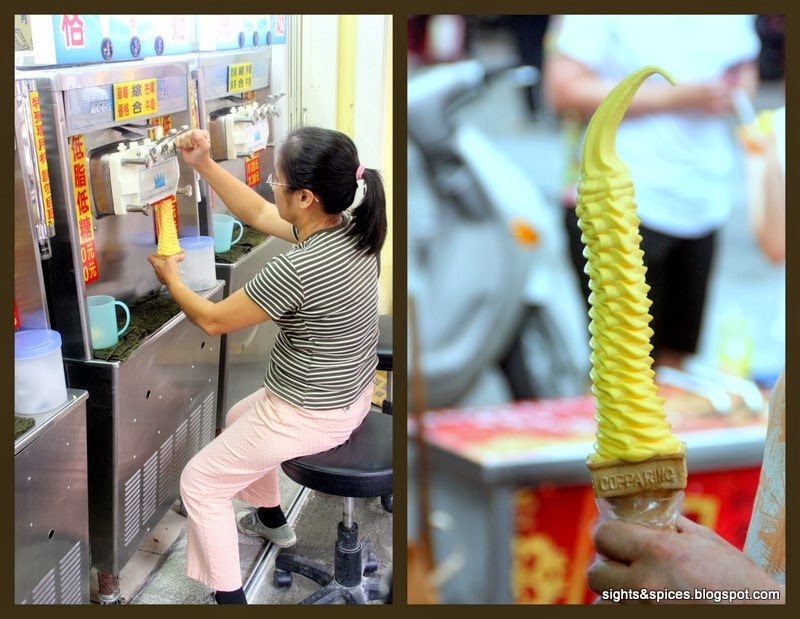 One of our favorite food finds in Taipei is one of the best if not the best custard I ever tried. The custard's brand is Porcini, I'm really not sure if this is a Taiwanese or international brand. Texture was perfectly smooth and creamy and it wasn't clawing sweet. There are different flavors and the one that I liked the most is the Green Tea Custard, it smell and taste of green tea. On our last day, we were supposed to dine at Din Tai Fung but the resto was packed with so much people. Achi Angie decided to buy a variety of Dimsum for take out and so we can eat it at a food court. Everything looked so pretty and it would have tasted better if we ate them fresh and hot. Though not hot, we still we enjoyed every little piece of dimsum, wiping out everything in minutes. Ahia Charlie made us try their version of the Taho or Beancurd Pudding, it seems that in Taiwan they eat theirs cold. Served with a watered down syrup and crushed ice, one can have it plain or choose from different toppings like beans, peanuts, bubble pearls, etc. Before heading for the airport, Ahia Benjie treated us to dinner before going home. We went to dine at Dumpling Tiger Northern Delicacy Restaurant (such a long name for a resto!). Thanks to Ahia Benjie, everything he ordered was delicious. The Xiao Long Bao wasn't as pretty as Din Tai Fung's but we enjoyed this better since we ate it fresh and piping hot. The Beef Noodle Soup had a clear tasty broth, tender slices of beef and the noodles still had a toughness when you bite into it. We had another chance to try the Flaky Scallion Pancake but this time around there were shreds of tender beef fillet and vegetables in the middle. So good! After eating our way through Taipei, I understood why Taipei was assigned the sin, gluttony. Literally anywhere you go, you'll find someone selling food. Restaurants, food shops, food stores, food stalls are everywhere, most of them are even open 24/7. But what's even more surprising and mind boggling is seeing a lot people eating during the wee hours of the morning. From breakfast to midnight snacking, it seems that the people here never stops eating. 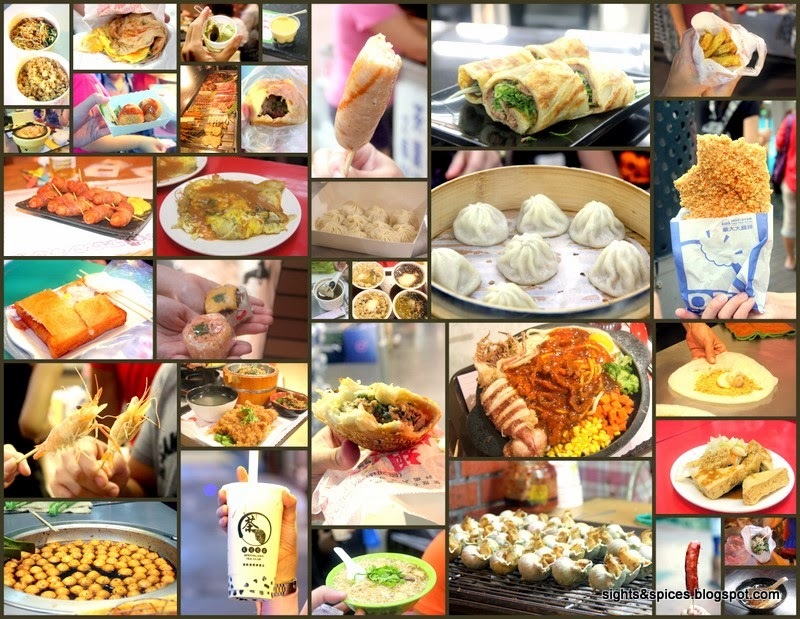 Taipei, Taiwan is definitely a food paradise, a place where you'll eat your heart out and become a glutton yourself. Hi Diego! Yes, I think it can be a challenge to go around the city. In our case, what we did is we showed them the picture of the place we wanted to visit via our hand held gadgets. They pointed us to the right direction and to our surprise they were all so helpful. So even with the language barrier, there is nothing to be afraid of. Enjoy Taiwan!